Come meet Skippy, Simon and William at PETsMART in Aliso Viejo located at 27961 Aliso Creek Road. On Saturday they will be out in front of PETsMART from moon - 4pm. Stop by and say "hello"! 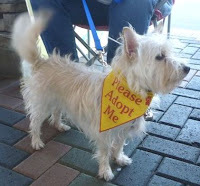 Our newest arrival, "Skippy" is a two year old Cairn Terrier mix. Skippy has spent a lot of his young life in a shelter. 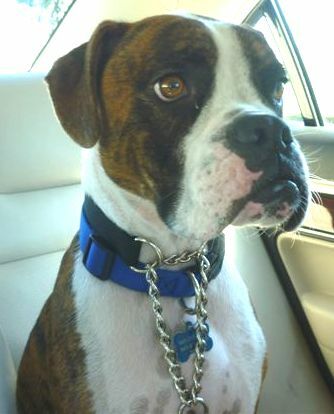 He was at the OC Animal Care Center in March 2011, returned in August and returned again November for being "too active". Skippy is a perfect choice for a fun, companion dog! He has an excellent temperament and is friendly with other dogs ~ he would be a great companion for your dog. Skippy is just 10 pounds and is fully grown. 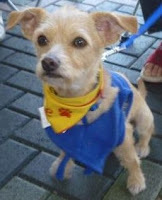 Skippy is great with everyone ~ men, women and children ~ he would be a great dog for the entire family! He is an active, friendly companion that you can take everywhere ~ he loves to ride in the car and likes to go for walks. Skippy also loves to play with his doggie toys. Skippy would like nothing better than to sit in your lap and keep you company." "Simon" had found a home in April 2011. He went home to be a companion for their other dog. Unfortunately Simon's owners decided that they could no longer care for their dogs. Simon was returned to Ariel Rescue. He is now looking for his "forever" home. Simon and Skippy play together in their foster home. Simon would make a wonderful companion for you and for your dog. Simon is very playful and likes to play with his doggie toys. Simon is great on the leash and loves to go for walks. Sweet "William" is also looking for a home. William is a two year old boxer who is a real gentleman. He is very well-behaved and loves to go for rides in the car. William was not brought up with dogs when he was younger, so he will need to be the only dog in the home. William would make a wonderful companion for someone who wanted a quiet, calm, well-behaved dog that would love to sit at your feet and keep you company.